An occluder is an object that is used to cull objects' surfaces, bounds of which are not visible behind it. Mesh Clutters cannot be culled by occluders. Occluders can be highly effective in case of complex environments where there are many objects that occlude each other and are costly to render (they have a lot of polygons and/or heavy shaders). However, effective culling is possible only if objects are not too large. If objects are big and have a few surfaces, it is likely that an additional performance load of an occluder will not pay off. If the scene is filled with flat objects or a camera looks down on the scene from above (for example, in flight simulators), it is better not to use occluders at all or disable them. The buffer is rendered in a low resolution. Occluder is a simple cuboid shaped occluder. 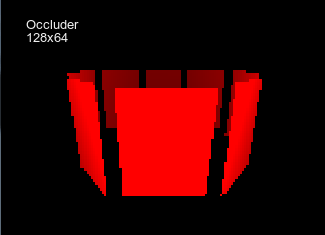 Occluder Mesh is an occluder based on an arbitrary.mesh file. Occluder Terrain is a cuboid shaped occluder based on a height map.